The 2019 Toyota Supra is finally out, but if you thought we were done with the seemingly endless teasers and concept cars, you were sadly mistaken! 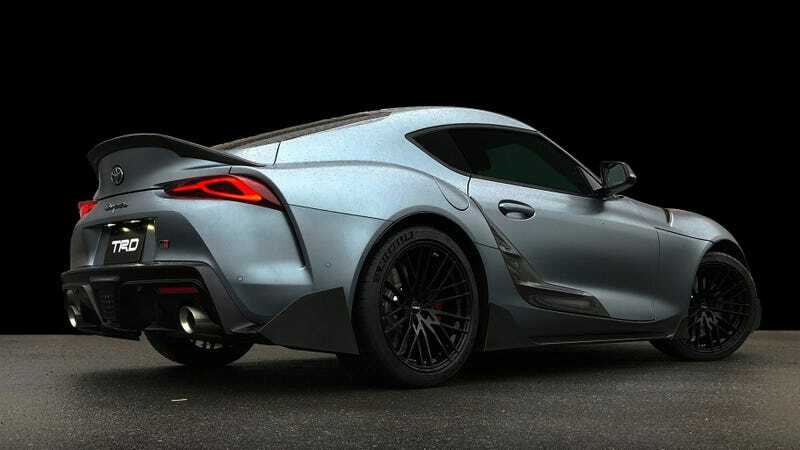 So here’s another one, called the Toyota Supra TRD Concept, which shows off all of the bits you can buy from the TRD catalog including a spoiler that exaggerates the car’s duck-tail rear-end even more. Well, according to Toyota’s Japanese TRD Parts website, the name of this car is the GR Supra Performance Line Concept TRD, but nobody has time for that. The web page essentially shows off a catalog of carbon-fiber parts that can be optioned on your Supra, though they don’t include any power increases, nor any significant performance improvements, it would seem. The concept’s parts include a three-piece carbon front splitter, carbon side skirt, carbon door insert, which probably still won’t feature a functional air vent, carbon rear “spats,” as the site refers to them, or rear diffuser if you’d rather, and the most notable and desirable piece for me, an exaggerated carbon rear lip spoiler that stretches the stock Supra’s duck-tail trunk lid even further into the atmosphere. I also really like the black 19-inch forged aluminum wheels, but would love to see all of these parts on a car that isn’t grey for a little more contrast. Toyota claims the body kit pieces do have an impact on aerodynamics, with the front splitter aiding high-speed downforce, the side skirts adding a “low center of gravity,” the new door piece is designed to avoid turbulence down the side of the car, the rear spats improve stability, and the spoiler is meant to extend the profile of the car without “jumping up,” so I’m guessing Toyota has moved on from the Supra’s past of having a big ridiculous spoiler. It’s a sad thing about not getting a giant spoiler, but maybe a good one for the aftermarket, as a previous fan rendering showed just how badass the car would look with an A80 Supra-style spoiler. The website didn’t list any cost for any of these carbon parts, nor the wheels, but I guess that’s why it’s still just a “concept.” But this is essentially Toyota and TRD’s version of the BMW M Performance Parts catalog, and I like what I see. I would def option the wheels, and I guess if I want the spoiler it would look silly not to get everything else.